I did it. 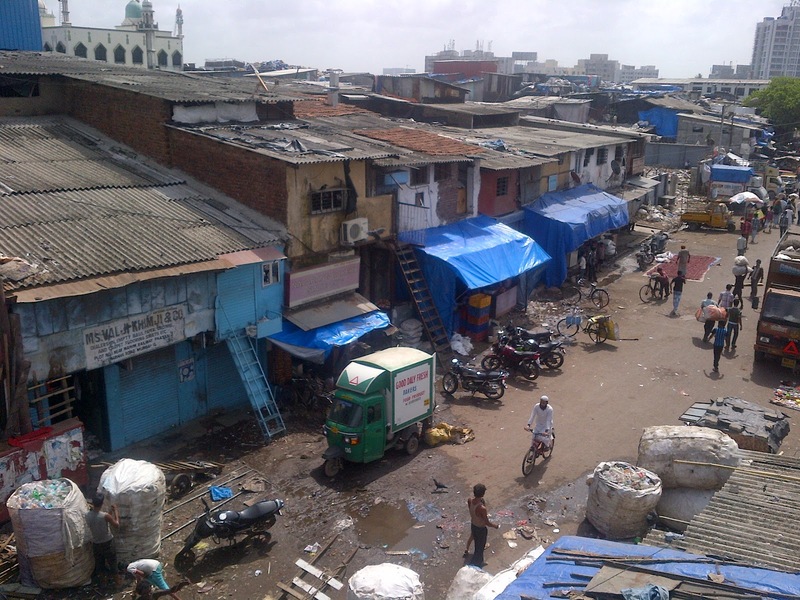 I did a tour of the biggest slum in Asia, Dharavi. Mahim station in the heart of Mumbai is where I met the rest of the tour group and the tour guide from marvellous Reality Tours & Travel. Prior to my arrival I made sure I was well prepared for a very long walk (being the start of the monsoon season), with covered waterproof shoes - (I knew I would freak out if I got 'ick' on my feet), a long anorak and a big bottle of water. It was going to be a long one. Reality Tours and Travel, provides educational and fun tours in and around Mumbai and 80% of the profits after taxes from these tours go towards funding the work of Reality Gives(sister NGO). You may think that it is voyeuristic to do a tour of a slum but by doing it this way, you get to see what really goes on in an organised and safe way whilst financially contributing to the community. We were not allowed to take pictures once inside the slum in order to preserve the dignity of the inhabitants but I did take the two below just before we went in. 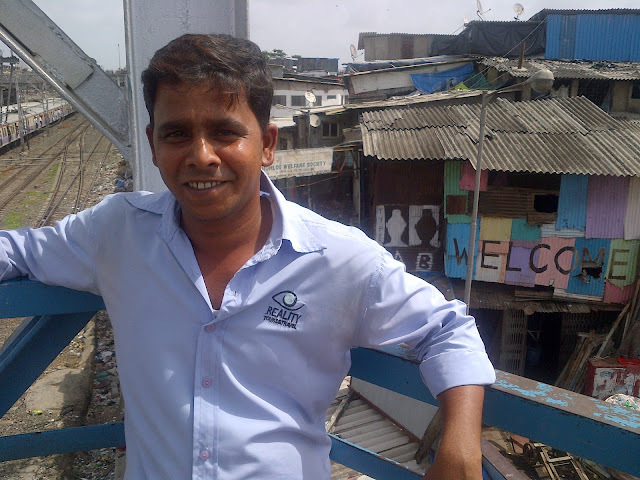 The first is of Ganesh, our enthusiastic and interesting guide and the second is a view of the entrance to the slum from the footbridge just down from Mahim station. View of one of the entrances into Dharavi. ﻿Dharavi of course was made famous by the film Slumdog Millionaire but what a lot of people do not know is that it generates $665 million turnover every year, mostly created by huge recycling activities, leather making and food production. Over a million people are packed into 1.75 square kilometers of land and many of its inhabitants are educated enough to work for multi-nationals companies. In fact I was surprised to learn that many of the original slum-dwellers actually rent out rooms in the slums once they are able to get out!! In a city where rent is sky high, some of the dwellings can achieve 1,500-2,000 rupees a month (£20-30). The main emphasis of the tour was to show us how self supporting the slum is and that everybody is working hard to better their lives and the lives of their children. We wound through tiny alleyways, up ladders and through rubbish dumps to see daily life. From a roof top we could see the amount of recycling materials that are brought from all over Mumbai, as well as other parts of the world such as the USA and China. Items such as fridge interiors, plugs & sockets, old phone handsets, plastic toys, paint tins and oil cans wind up here. The plastic items are all processed in machinery mostly made in the slum itself and comes out as tiny pellets that can be later melted and moulded into any plastic object you want. We saw a massive warehouse full of huge vegetable oil tins that would be cleaned in boiling vats of water for reuse later and aluminium items that are re-processed in large grossly hot furnaces with deadly aluminium dust flying around and no type of breathing protection for the men tending them. The health and safety aspect of this tour will leave you speechless when you see what kind of conditions these people have to work in when it is already so hot and humid outside to begin with. There are no gloves, no eye protection, no overalls, no NOTHING! Wondering through the residential areas, we got to see the tiny cubes that families of up to nine or ten sleep in. They contain a small tub in one corner for the ladies to wash themselves (the men and children have to clean themselves outside in the alley) and nothing else. There are no cupboards or anything that could take unnecessary space and everyone sleeps on the floor. Most have electricity and access to water but most people have to use the government supplied latrines to go to the toilet. In India it is a well known fact that only about 30% of people have access to a toilet but yet most people (at least 60%!) have a mobile phone. It amazed me to see so many people in the slum, sitting around chatting on their cellphones, when they otherwise have next to nothing. Some of the units were fully equipped with televisions and satellite TV (a bit like your English Council house then) and refridgerators. The communities have access to schools, English lessons and womens' groups. There is even a women's football team which is very popular with young students. The children that we came across in the alleys, up ladders and in the rubbish dumps were extremely delightful. They all want to say hello and cling on to your hand. I never once saw a child crying or without a smile on its face (except when I tried to play ball with a little toddler boy and ended up throwing it at his head by accident!). Apart from being utterly exhausted by the Mumbai heat, I did come away from the tour with my preconceptions of what a slum should be blown out of the water (although we are told Dharavi is unique in maintaining its own economy). I would highly recommend that anyone visiting the city gives it a go. And I would also highly recommend that you use Reality Tours & Travels (Reality Gives) as the tour fees will be reinvested into the Dharavi community. We paid 500 rupees for the 2.5 hour tour (about £6/$9.50) and there is also an opportunity to buy picture postcards, T-shirts and canvas bags at the Reality Tours office at the end of the gig. (I of course never miss an opportunity to buy a bag - which I did for 500 rupees).